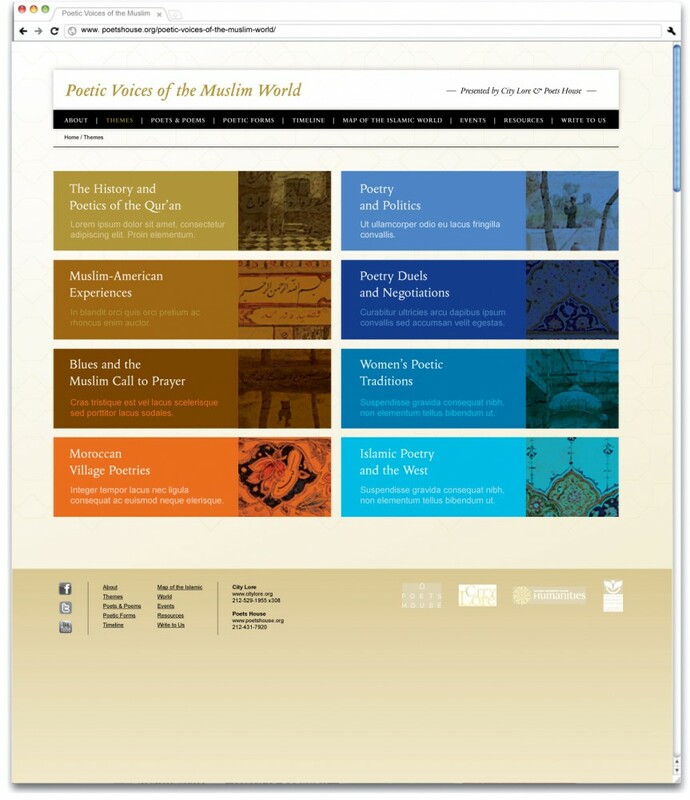 Launching in 2013, Poetic Voices of the Muslim World’s interactive website will a) introduce visitors to Poetic Voices of the Muslim World; and b) provide visitors with a more exploratory and in-depth experience both at the libraries where the exhibits and programs take place and on the worldwide web. The site also acts as a promotional piece for libraries to use to increase interest and audiences for their exhibition and public programs. The website will offer an overview of the background, purpose and logistical information for Poetic Voices of the Muslim World, such as descriptions, locations and dates for talks, discussions, and more in-depth background on the programs. By providing access to the project materials in complex multidimensional ways, the site offers visitors in their homes, educational settings, or the host libraries opportunities to engage with the poetries and cultures of Muslim societies.